Earlier import policy has been formulated for two years. But present import policy order have been formulated for 5 (five) years, Effect from the 14th June 1999 to 30th June 2003 and valid till announce of new import policy order. If require Government can revise the policy in each every years. 2. ITC number is compulsory (H.S code 6 digit) to be mentioned in the L/C and LCAF to identification the item to be imported. H.S code of seven digits as mentioned by Bangladesh statistical Bureau to be used. 9. Country of origin: Mandatory should be clearly indicated at the body of packing / container / box / packet etc. 1. Books, Journals, Magazines and Periodical again sight draft or issuance bills. 2. Any importable item value up to USD 5,000 per year. Except for Myanmer each chalan USD 5000 and no yearly amount restriction. 1. Importation of books, Journals, Magazines and periodical and scientific lab equipment surrendering UNESCO coupon. d) Cargo passenger ship for ocean ship maximum 20 years old importable. f) Fishing Troller (sea) New or highest 20 years. 3. Excess goods imported by passenger baggage rule. 4. Simple, advertising item more than allowable quantity. Deferred payment basis import complying Bangladesh Bank terms and conditions. All other items item 09 months. No amendment for value increases of extension of shipment validity. Unless otherwise specified items which have been indicated as banned in this list shall no be permissible for import. An items included in this list with specific conditions for import shall be importable only on fulfillment of the conditions specified. Unless otherwise specified an items the name of which does not appear in the control list shall be freely importable. 3. Notwithstanding anything mentioned else where, all imports into Bangladesh shall be subject to such general or specific conditions as many have been prescribed in this order. 4. In addition to the conditions mentioned in the control list the conditions. Restrictions and procedures for import of various items mentioned in the test portion of this order, shall as usual, apply in case of import of those items. 5. If, while determining the import status of an items mentioned in the control list the description of goods does not conform to the H.S.C Code mentioned against item, or any discrepancy arises between the H.S Code and the description of goods, in that case the description of goods shall prevail, In other words, if the import of a particular item is shown as banned in the control list, or is shown as importable as subject to fulfillment of conditions in the list, the said ban or restriction as the case may be, shall equally apply to the import of that item , even if such ban or restriction is mentioned else where and not against the appropriate H.S Code, if any importer, taking , advantage of such discrepancy, import any banned items or restricted items or restricted item without fulfilling the respective conditions, such import shall be treated to have been made as in contravention of the provisions of this order. All provisions rereading export as mentioned in this order shall apply in case of export of goods. a) i) Foreign Currency Reserve in Bangladesh Bank. 2. Special Trading arrangement (STA). For import purpose, use of new ITC Number (H.C. Code) with at least 6 (Six) digits corresponding to the classification of goods as given in the Import Trade Control Schedule 1988, based on the Harmonized commodity Description & coding system, shall be mandatory, But in case where a particular items has classified under an H.S. Code Number with more than 6 (six) digits, in those cases it shall e mandatory to use that specific code number (having more than six digits.) No bank shall process any LCA Form. Or open any L/C without properly recording the corresponding ITC Number (s) for the item’s to be imported. Goods from south Africa & Israel or goods originating from these two countries shall not be importable goods shall also no be importable in the flag vessel of these two countries. Import shall be made at the most competitive rate & the importers may be required, at any time, to submit documents regarding the price paid or to be paid by them. This order shall be exempted up to TK. 1.00 (One) Lac fro opening of the L/C. Unless otherwise specified reshipment inspection of imported goods shall not be obligatory in case of import by the private sector importers. All imports by Sea, Air & Land route shall be made on cost and freight basis, Import on free on board basis may be made strictly observing Bangladesh Bank’s Circular, Before opening If L/C necessary insurance cover note should have to be purchased form the insure ace Co. No import shall be allowed on CIF basis without prior approval from the Ministry of Commerce. Shipment of goods shall normally be made on Bangladesh Flag Vessels. No import License will be necessary import of any item. Unless otherwise specified no import irrespective of the source of finance, shall be allowed exchange through submission of LCA Form, duly filled in, to the concerned nominated bank. Unless otherwise specified import shall be made only by opening irrevocable L/C. Import against L/CA Form But without Opening. a) Import of books, Journals, magazines and periodicals on sight draft or essence bill basis. b) Import of any permissible item for an amount not exceeding US$ 2500/- only during calendar year against remittance made from Bangladesh at WES rate. L/C: may be open under deferred payment basis. Only for Bangladeshi National who live in abroad for service. Those who are entitled to purchases the importable goods for direct payment to the beneficiary from his own service without opening any L/C, The goods must be sent to the Bangladesh. Nationals who lived in Bangladesh. In that case no approval is required from CCI & E.
Letter of Credit shall be opened by all importers within 120 days from the date of registration of LCAF with the Bangladesh Bank unless otherwise notified. Unless otherwise specified, shipment of goods shall take place within 17 month in the case of machinery and spare parts and 11 months in the case of all other items form the date of issuance of LCA from by Bank or registration of LCA form within Bangladesh Bank registration unit as the case may be. Importers in both public sector and private sector shall submit to their nominated banks the following documents along with the L/C authorization Form for opening letter of credit. a) L/C application form duly signed by the importer. a) The nominated bank shall keep in its safe custody the passbook issued by the Import control authority n favor of recognized industrial units and registered commercial importers in the private sector. LCA Forms and other relevant papers shall be submitted by the importers to their respective nominated bank only for the purpose of import by opening L/C. b) While accepting LCA Forms from a private sector import the nominated banks shall ensure that the concerned importer has a valid Import Registration certificate that the requisite renewal fees have been duly recorded in the passbook of the said importer. c) L/C for import of capital machineries and initial spares or setting up a new industrial unit, however, be opened without any import registration certificate (IRC) or Passbook after obtaining exemption shall be necessary from the sponsoring authority for such import at WES rate against own finance in respect of industrial units i the free sector. The passbook of the importer shall remain in the safe custody of their nominated Bank. An importer may change his Bank on the basis no objection certificate from his present Bank. The importers all over Bangladesh may for more or more groups for import permissible items valued up to US$ 2000/- for their own use without any permission from the Import control authority. And other food items produced in any Country, Test of radioactivity Levels present in those items is mandatory. Any commercial importer may import permissible items of industrial capital machinery for any amount for commercial purposes. Where the value of a single item authorized for import is Tk. 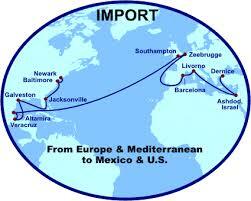 5.0 Lac or above, the importing agency shall arrange pre-shipment inspection. Importable only with clearance form the director Drugs administration. Recognized units under readymade garments industry operating under bonded ware hour system shall be permitted to import their permissible raw & packing materials on the basis of confirmed and irrevocable letter of credit for export of readymade garments against back to back letter of credit. 5. Temporary import re-export be made. 6. Import at EPZ and Export there from out of this policy order. 7. Human consumable item import: Milk produced item, edible oil etc. a) Radiation Test amount of cesium –137 per kg cited in the document. b) Fit for human consumption certificate. 2. Capital machinery LCA/IP Frees expected permission required. 3. Ms sheet GP sheet Stainless sheet, CRC sheet, Yin plate sheet MS and silicon sheet, secondary Quality as a per entailment for recognize. 4. Black list approve to be approve by director, Drug Administration for important of raw material materials for pharmaceutical Industry. 5. Readymade Garments through BBL/C 75% irrevocable FOB export L/C value is entitle to import (Oven Knit Garments) presently 100% allowed for local BB L/C. 6. In Case of FOB value USD 60 or above per Sozen for Quot Items 80% non quota 85% import is allowed.